The Marvin Companies new digs in Eagan, Minnesota spotlight their windows and doors. When the Marvin Companies, designers of windows and doors, needed more room to accommodate its growing marketing, IT and legal teams, it turned to Shea Design to create a window-filled workspace with the theme of “Lake of the Woods Meets Modern Nordic.” The theme is a nod to the company’s headquarters in Warroad, Minnesota on the edge of Lake of the Woods. The company’s portfolio of windows and doors was incorporated throughout the space to showcase the design flexibility of the products and the tremendous impact they have on a space and its inhabitants, in addition to helping employees, prospective dealers and customers better understand the possibilities of the Marvin product lines. 28,341; roughly 16,000 square feet was renovated. Approximately 55 employees office in the renovated portion of the workspace. The design of the space centers on enhancing creative thinking and encouraging collaboration. 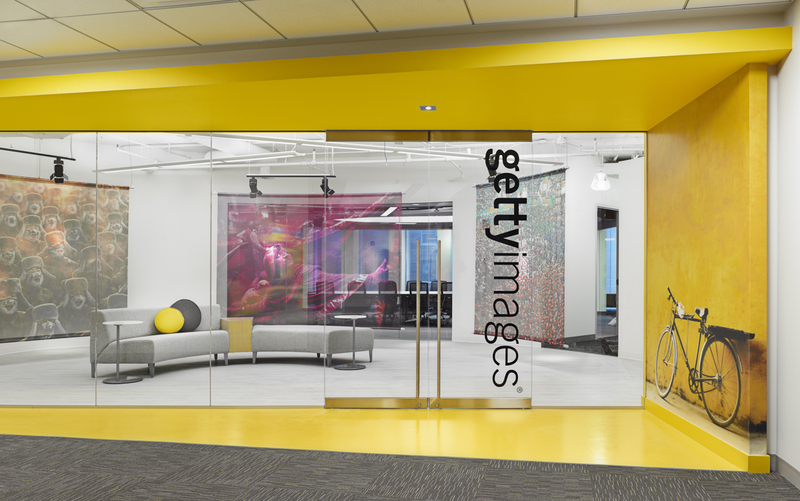 The goal was to create a highly collaborative, high-performing workspace that reflects Marvin’s commitment to design. The new layout features an open floor plan to allow for an abundance of natural light with integrated enclosed areas for those times that require more privacy. Designed for the way people want to work, the new workspace includes an intentional mix of “me” and “we” spaces—areas where teams of various sizes can gather to brainstorm or individuals can break away during projects requiring intense focus. The team environments were informed by leading hospitality design trends and orchestrated to encourage impromptu huddles through the use of minimal or transparent partitions, warm and welcoming décor elements, and “plug and play” audiovisual equipment. The individual alcoves are enclosed or semi-enclosed by an assortment of Marvin, Integrity and Infinity windows and doors, offering an increased sense of privacy while still allowing for light transmission and a sense of connection with the larger office. The redesigned layout includes a kitchen and dining area equipped with appliances for employees to store and prepare food along with vending machines. In addition, a large portion of the office is designed to have direct access to a sizable outdoor patio space. Through a Marvin Ultimate Clad Bi-Fold Door with a built-in screen, employees can either remain at their desks while enjoying the fresh air or work at various patio sets by Loll Designs. The renovated office is located in Eagan, Minnesota, a suburb of the Twin Cities. For more than 25 years, the company has enjoyed the many benefits Eagan has to offer for employees and the business, including convenient commute times and ample free parking. It’s an ideal location for The Marvin Companies because it’s close to the Minneapolis-St. Paul international airport, allowing employees easy access to flights and to the company’s fleet, which brings customers and other guests to the headquarters’ office in Warroad, Minnesota every day. 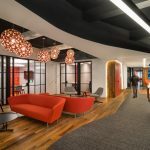 Employees were active stakeholders in the redesign and participated in focus groups before the renovation to ensure Marvin understood how the new design could help them work more efficiently, encourage collaboration and foster creativity. Employees were active participants in the redesign process—sharing thoughts and recommendations before, during and after the project’s completion. In addition, construction updates were provided throughout the process to keep employees informed on building and design progress from groundbreaking to move-in day. In renovating the office, one of the main priorities was to ensure all employees would enjoy access to the benefits of natural light. This resulted in a major layout shift, with the elimination of traditionally closed-in office spaces, and instead constructing only semi-enclosed spaces with transparent window partitions at the center of the space. Employees were moved closer to exterior windows, and their workstations were designed to be as open and conducive to transmitting natural light as possible. In areas with limited natural light, the designers employed lighting from Tala, which is designed to mimic nature. As soon as you walk through the doors into the reception area through to the outdoor deck in the back of the office, Marvin branding is incorporated in both direct and indirect ways throughout the entire space to showcase the rich, 106-year-old heritage of the company. The Marvin brand was also incorporated through the “Lake of the Woods Meets Modern Nordic” design theme, using light and airy hues as well as natural material and wood elements to create warmth. A few other examples of incorporating branding throughout the design include Marvin Windows and Doors’ iconic logo featured on a large TV screen behind the welcome desk on various texture backgrounds found throughout the new space. As you venture further into the office to the Lake of the Woods conference room, Marvin’s more than 100-year heritage spans one wall of the room through a collection of memorabilia and employee-produced décor items that speak to Marvin’s rich history and tradition of craftsmanship. In the Loon Lounge kitchen and dining area, a custom made wallpaper by SheShe features yellow roses, deer, loons and the North star. These are just a few examples of how Marvin pays homage to its heritage and Nordic roots in the Eagan workspace. Incorporating the beautiful windows and doors that compose The Marvin Family of Brands portfolio of products (Marvin Windows and Doors, Integrity Windows and Doors, Infinity Windows and Doors and TruStile Doors) throughout the remodeled space is the most unique feature of the new space as it allows employees to enjoy the many benefits of the products, including natural light, fresh air and a connection to the outdoors. In addition, the incorporated products allows for the the office to operate as a de facto showroom – highlighting the design flexibility and personalization opportunities presented by Marvin’s portfolio and the tremendous impact the products can have on a space and its inhabitants. Secondly, it was important to Marvin that its employees engage with the products firsthand to create connectivity and a tangible experience to base their work around. The remodeled office can now help inform, educate and sell-in the Marvin Family of Brands suite of products, both to employees and prospective dealers or customers. Knowing the benefits of being close to nature and having access to outdoor space during the workday, a large portion of the office is designed to have direct access to a sizable patio space. Through a Marvin Ultimate Clad Bi-Fold Door with a built-in screen, employees can either remain at their desks while enjoying the fresh air or work at various patio sets by Loll Designs. In addition, three layers of sound insulation are used to ensure a manageable volume in the open-style workspace, including K13 spray on ceiling surfaces, acoustical panels made from recycled t-shirts and white noise created by small hanging speakers. Finally, all employees’ spaces are equipped with automatic standing desks, allowing users to easily sit and stand as they please throughout the day to promote wellbeing. What kind of technology products were used? If the company relocated to new space, what was the most difficult aspect of the change for the employees? The company did not relocate to a new space, however, employees worked from home during the nearly five months of construction. A lot of people inquired if it was difficult for employees to transition back into the office after working from home for an extended period of time. Although Marvin already had a work from home policy prior to the renovation, feedback and engagement indicate employees are more motivated than ever to come into the office and employees who participated in the work from home policy prior to the renovation are spending more time in the new space. Marvin utilized department meetings and meet-and-greet discussions with the design and building teams to introduce the renovation concept and building plans. A detailed Q&A document was developed and updated frequently. In addition, employees received regular email updates that included imagery of the design plans, construction progress and fun facts about the evolution of the space. Were there post occupancy surveys? While formal surveys have not yet been conducted, there are plans to do so in the future. However, large group feedback sessions have been held to collect initial feedback on favorite features, areas that could use refinement and suggestions for ongoing consideration. If a change-management program was in place, what were the most successful strategies? The most successful strategies focused on timing and consistency. Reaching employees early with pertinent information, providing ongoing updates and maintaining excitement for the coming improvements. Check out the story and photos of their buzzy South Melbourne space.